Hello, and thank you for visiting page about us. The fact that you are here speaks volumes. It tells me that you care to check sources of information you found on the Net. It also tells me that you do your homework before you invite a professional into your home. My name is Dmitry Monastirsky, and I am a Master Plumber and the founder of A to Z Plumbing & Drain. 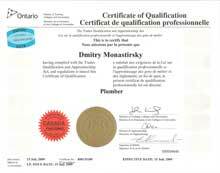 I came to Canada from the Ukraine more than 10 years ago, and started my plumbing business in 2002, after training and getting licenced and certified by the City of Toronto as a Master Plumber. My background as a mechanical engineer is very helpful in my career as a plumber. I read blueprints with ease, which comes handy for the estimates, especially for the big jobs. I can give a very accurate estimate without even seeing a property sometimes. But this is not the only benefit. I am trained as an equipment repair engineer at the International University of Civil Aviation Engineers in the Ukraine. This is a very hands-on occupation that requires creativity and non-conventional thinking while adhering to the strict codes and standards one hundred percent. When you are selecting a plumber, every professional has a history and strong points and experiences under his belt. When you choose to work with me, you get an engineer and a plumber... And a customer service addict. I started this company because I had a vision. 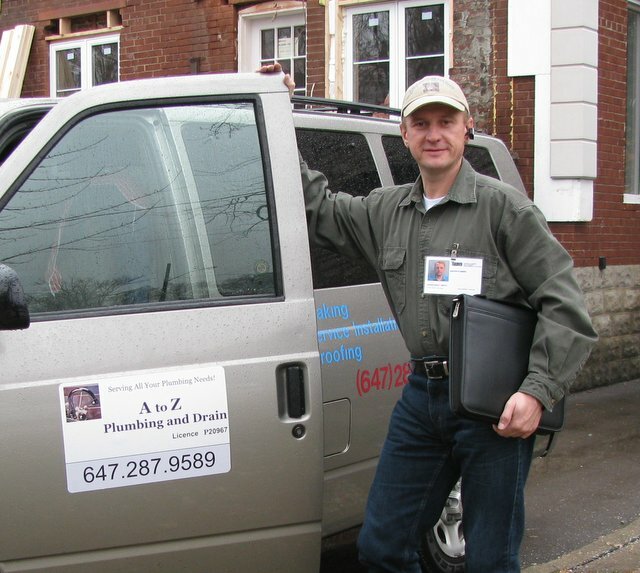 I worked in the industry with different plumbers in Toronto before I started my own business. There are still plumbers who stain your carpets with dirty footprints, leave your house in disarray, and charge you for just showing at your door. There are still people out there who don't care to be punctual. They make you waste your hard-earned vacation day by showing up late and then scheduling another appointment. And the practice of overcharging is still alive. Having clean, organized environment, and showing up on time is very important to me. Your time is valuable, you don't want to spend it waiting for me and then cleaning up after I leave. Anyone who works for me is expected to come on time and leave the house in the same condition as it was before their visit. Doing a great job and seeing eyes of my grateful customers light up with joy when the problem is fixed is what makes me feel like I am contributing to the betterment of my industry... and makes my day. Honest charging is a matter of my professional ethics. But I go even further. Every month I run a promotion and give my customers even more - either discount or a free home plumbing inspection. Over the years, I have become a family plumber for many of my clients as they trusted me and passed my cards on to their family and friends. And now I have a team of plumbers working for me. I require that they adhere to the same principles that form a core of my vision for my company. I still come to your home to do estimates and discuss customized plumbing solutions for your house. Please browse my site if you need to learn more about plumbing. If you are in Toronto and GTA, and want someone to fix your plumbing or unclog your sewer or drain, just call me at (647) 287-9589 or (416) 519-4919. I beat any written estimate and I will work hard to become your Family Plumber. Take a look at our Plumber rates for a price list for our services.